Kalrez® is an extreme service elastomer with unprecedented temperature (600°F) and chemical resistance. Kalrez® offers chemical resistance comparable to Teflon® — with the resiliency and recovery of rubber — making it an extremely versatile material. There are many Kelrez® compounds designed to handle specific services. Contact your local ARTG branch for more information. Kalrez® parts help stretch your mean time between repair (MTBR) and lower your maintenance costs. Their durability minimizes unscheduled downtime while letting you extend time between routine inspections and replacement cycles for critical components. By reducing the frequency of seal changes, repairs and inspections, you can increase process and equipment uptime for greater productivity and yield. Lasting longer and performing better than other elastomers, Kalrez® helps reduce the risk of chemical exposure from seal failure. Kalrez® and Kalrez® Valve Stem Packing Systems can help you reduce leaks and fugitive emissions for improved compliance with environmental regulations. Because Kalrez® parts maintain their sealing integrity, you reduce your risk of environmental non-conformance. 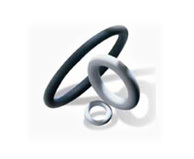 Kalrez® parts are made only by DuPont Performance Elastomers, a fully integrated manufacturer of Viton® fluoroelastomers and Neoprene rubber polymers, as well as perfluoroelastomer parts. Kalrez® parts are manufactured in ISO 9001 quality certified facilities and packaged in a bar-coded bag for full traceability.